Latest Trick to buy Micromax YU Yuphoria on Amazon (below is the Auto Buy Script Code in snippet): After success of Micromax's YU Yureka's flash sale on Amazon, company introducing new phone YU Yuphoria at very affordable price of Rs 6999 only. & First flashsale will start on Information Guru's birthday which is 28th May 2015. Updated for the flash sale on 20th August 2015, Thursday 12 PM. "Stay tuned we will publish new auto buy scrip just before 1 day of flash sale, if this script doesn't work". OR Try to Refresh your browser. OR You can also try manually also if code doesn't work, luck will be yours. We strongly recomended to use this script as this become very useful for Yureka on Amazon and Mi 4i buyers on flipkart. Step 5: Keep tab opened. 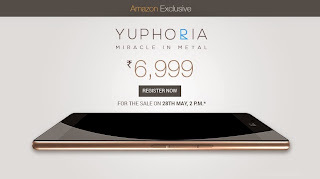 & Keep an eye on Amazon YU Yuphoria home page for any updates. Press CTRL + D to bookmark this page for the flash day sale.